Baker, E. (2005). Can Preservice Teacher Education Really Help Grow a Literacy Teacher? : Examining Preservice Teachers’ Perceptions of Multimedia Case-Based Instruction. 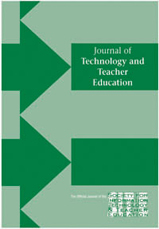 Journal of Technology and Teacher Education, 13 (3), 415-431. Norfolk, VA: Society for Information Technology & Teacher Education. Retrieved April 24, 2019 from https://www.learntechlib.org/primary/p/4725/.